Many of us are desperate to lose weight. Perhaps, you have prepared yourself for an all-out battle to rip off excessive body fat. Now, you are looking for the best meal replacement shake that can aid you in the battle by helping to control your appetite and craving. Of course, using a meal replacement shake is one of the best methods that have been proven by many people to be effective for weight loss purposes. However, keep in mind that you should also enhance the progress by exercising and working out regularly. You don’t have to be extreme with the intensity, because the key here is your commitment and perseverance not to give up so easily. When you are trying to lose some body weight, it is important to lower your calorie intake. But you should not diminish your calorie intake to absolute zero – your body and digestion system still need some food in order to function properly and perform the daily activities. The trick is consuming slightly fewer calories than what you normally need every day, so that the body will burn the accumulated body fat for additional energy, thereby reducing your body weight. In addition, you should also reduce your carbohydrate (carb) intake and replace with protein. This is because protein requires more time and energy to be digested and absorbed by the body than carbs. Fats should also be reduced in your daily consumption. Sodium, while not having a real impact on the body fat, is generally recommended to be reduced, too, because a high sodium level can increase the amount of water in your body, making it appear as if you are not losing weight at all. Now, comparing the nutritional contents in both Idealshape and Shakeology, we should note that Idealshape contains higher fat, cholesterol, and sodium than Shakeology. But Idealshape has potassium, lower calorie, lower carb, and significantly lower sugar. With just 120 total calories per serving, Idealshape can help you burn down your body fat better. In addition, the fact that it only has 1g sugar and 11g total carb means that it really limits your calorie intake. The 5g fiber content is pretty good; fiber is one of the key factors of appetite control. However, the fat and cholesterol contents are kind of disturbing what would otherwise be a very good formula. Fortunately, the 3.5g fat and 10mg cholesterol are still considered low if compared to a regular person’s daily consumption limit. The 11g protein content is slightly lower than Shakeology’s. On the other hand, Shakeology has higher fiber and protein, as well as lower fat and sodium than Idealshape. It features 6g fiber in each serving, and boasts 17g protein per serving. It only has 2g fat and 150mg sodium in each serving. It does not contain any cholesterol. However, the 17g total carb and 6g sugar are kind of high for a meal replacement shake. In addition, it contains about 160 total calories. So, with Shakeology, you will have to make your body work a little bit hard in order to burn down more calories, perhaps by exercising a little bit longer and frequently. But, if you are a very active or busy person who has lots of things to do every day, the higher calorie and sugar contents may actually be useful for you, as they can give you the extra jolt of energy you need to get through the day. There are a few more things that you need to consider. Idealshape is gluten-free, which is great if you are gluten-intolerant, but it contains whey protein, soy, and an artificial sweetener (sucralose). Shakeology contains gluten, but contains neither soy nor artificial sweeteners/flavors. This shake indeed has whey protein, but there are two dairy-free vegan options that you can choose if you are vegan lactose-intolerant, or allergic to dairy products. 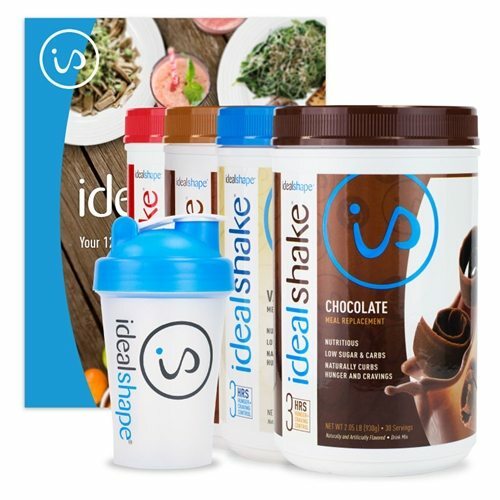 Winner: Idealshape is generally better than Shakeology due to the lower total calorie content, but you should consider if you need the slightly higher calorie option instead. Don’t forget to consider if you are allergic to gluten, lactose, or soy. Idealshape is gluten-free, but has lactose and soy. Shakeology has some gluten, but is soy-free and provides dairy-free options. Even though fiber is one of the key factors to appetite control, it is not the only player, and these two meal replacement shakes have used slightly different methods in their approach. Idealshape controls hunger and craving by using both fiber and a formula called Slendesta. Slendesta is extracted from proteinase P12, a protein found under the skin of a potato that promotes cholecystokinin (CCK) release in a human body. In turn, CCK signals the brain into thinking that the stomach is full. Hence, the brain will think that you should stop eating sooner and stop craving. The combination of fiber and Slendesta is very effective. You will feel full immediately after consuming the shake, and the fullness can last for about three to four hours. Idealshape is also very effective in reducing cravings, and it will make you less likely to snack between meals. On the other hand, Shakeology uses fiber in combination with vitamins, minerals, and proteins to block hunger and curb cravings. If the vitamin and mineral needs have been fulfilled, your body is less likely to crave for snacks or meals. The essential amino acids found in the proteins helps to curb hunger pangs. However, not all flavors of Shakeology are created equal. According to the official website, the Chocolate and Greenberry shakes are the only variants that come with whey protein isolate and 23 vitamins and minerals not available in other flavor choices. With the Chocolate or Greenberry shake, you can stay full and happy for about three hours. With one of the other flavors, the effect only last for two hours at most. 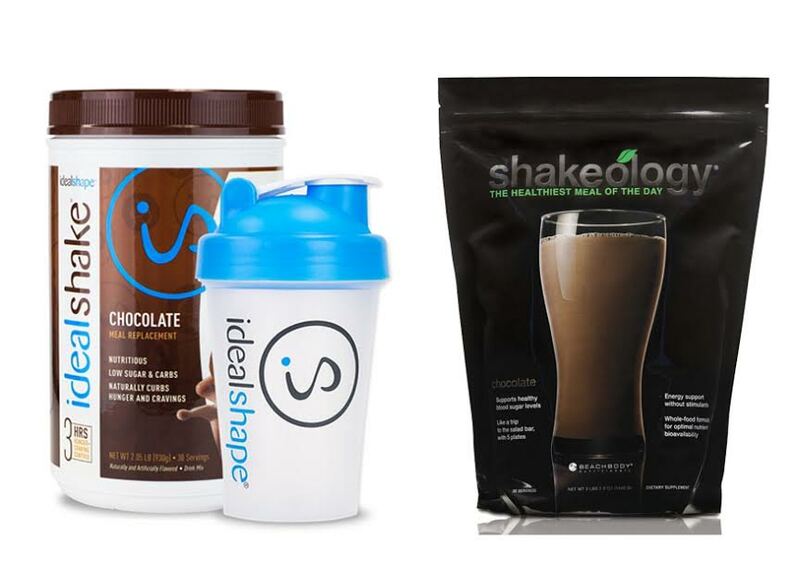 Winner: Idealshape is certainly better than Shakeology in controlling the appetite and hunger. It keeps you full longer and prevents you from snacking more effectively. Let’s not pretend here; taste and texture are important. You will find your journey to weight loss much more endurable if the shake tastes nice. If you can’t enjoy consuming the meal replacement shake, you are more likely to give up in the middle of your progress. Please, ease yourself by getting something that is truly edible. Idealshape is available in seven flavors, featuring vanilla, chocolate, cookies n cream, mocha, chocolate cream pie, strawberry, and orange cream. Included in the box is a smoothie recipe booklet. The booklet provides you some options to change the ingredients a little and mix things up. Even so, the shakes already taste pretty good, even without needing you to mix and combine additional ingredients. One nice, simple trick is that you can try to mix it with almond milk. The taste is awesome. If you have some more time to spare, you can try to experiment using the recipes provided in the booklet. There are various combinations available, and they all taste great. The texture is very good. It comes in a powder form, which then you can mix with other ingredients like water, ice, juice, milk, or almond milk. They blend pretty well into a smooth shake. You can still expect a grainy texture that characterizes powdered shakes, but there is no chalky flavor that people often fear from such shakes. Thanks to the fine powder, Idealshape can have a fairly good texture. On the other hand, Shakeology is available in various flavors, such as chocolate, strawberry, café latte, vanilla, and greenberry. There are also two vegan variants: Chocolate Vegan and Tropical Strawberry Vegan. Unfortunately, these flavors are not strong enough to mask the cardboard taste behind the shakes. At least, the strawberry flavor tastes pretty good and tolerable when combined with some orange juice. Shakeology also comes in a powder form that is meant to be mixed with liquid ingredients or blended with fruits and ice. The shake is also successful in avoiding the feared chalky taste here, but, unfortunately, it does not blend as well as Idealshape. With Shakeology, no matter how long you blend it with the additional ingredients in your blender, you can never eliminate the large granules in the shake. You can feel that it leaves some residue in your mouth after swallowing. It also leaves some in the glass. Winner: Ideology is definitely the winner in this aspect. It has a great taste and fairly good texture. You can also mix it with various options provided in the booklet. It will be much more enjoyable. Shakeology, while providing wide flavor choices, generally does not taste as nice and does not have a smooth texture, either. Both products here come with each own weight loss program. Interestingly, both products here refer to their programs as a lifestyle change instead of a diet, which is true. In order to lose weight in a healthy manner and to prevent yourself from getting fat again after the program, you need to change your lifestyle to the healthier, and it requires significant effort and commitment. The Idealshape’s program consists of two Idealshape shakes and two Idealshape bars per day. It encourages you to replace your breakfast with a shake, take a bar and a shake for lunch, have a bar for an afternoon snack, and finally end the day with a healthy supper in the evening. Making the shakes may take some time and work, especially if you want to include ingredients that require peeling or blending like fruits and ice. The wise idea is to spare a dedicated time in the morning to prepare the shakes for the day. Don’t worry about the bars because the bars are all pre-wrapped, ready to be put right away into your lunch bag and quite simple to grab on the go. On the other hand, Shakeology does not actually come with a full program. The company’s fitness programs are the ones that include the full meal plans. Typically, they recommend you to replace just one meal with a shake a day, and then follow the meal and exercise plan provided by your chosen fitness program. Usually, this means replacing the breakfast with a shake and working out once daily. You also need to prepare carefully other snacks and meals based on serving sizes and color-coded containers. Preparing the shakes also need some time and effort. You can simply mix the shakes in a shaker bottle, but, if you want to add additional ingredients, you will need to use a blender. Winner: The programs of Idealshape and Shakeology are clearly suited for different people, so it is a tie. Idealshape’s program is simpler and easier to be slipped into a tight schedule, suitable for busy people. However, if you are ready to spare some more time for a more thorough program, Shakeology’s program is great because exercise and work out are an integral part of the overall process. Idealshape is generally better because it has lower calorie content and better taste and texture. Its program is simple and easy to be put into an already tight schedule. However, while it is gluten-free, it contains dairy products and soy. Shakeology’s vegan options can be your choice if you prefer a dairy-free and soy-free product; the program is great due to involving exercise and work out.